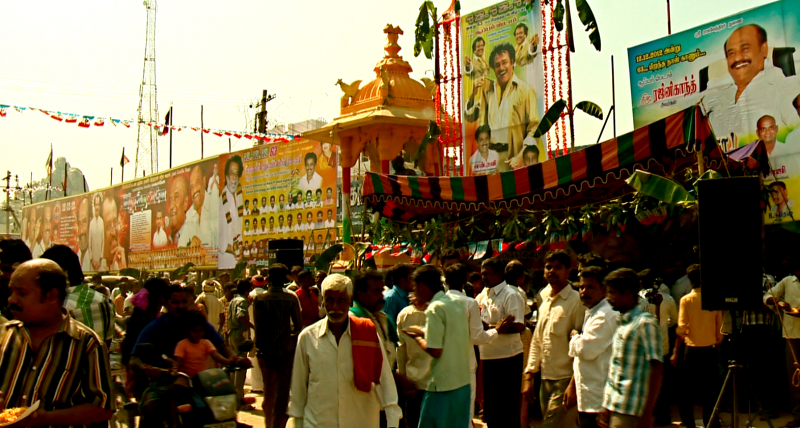 LOCKLINEA documentary exploring the phenomenal fan following of Superstar Rajinikanth. This film has been an extremely dear project both for Joyojeet and me, as both of us have grown up with a passion for Indian cinema. We have spent close to 4 years in research, watching films, spending time with fans and filmmakers, and finally documenting a number of key events. Our intention is to make a film that captures two important and parallel issues. 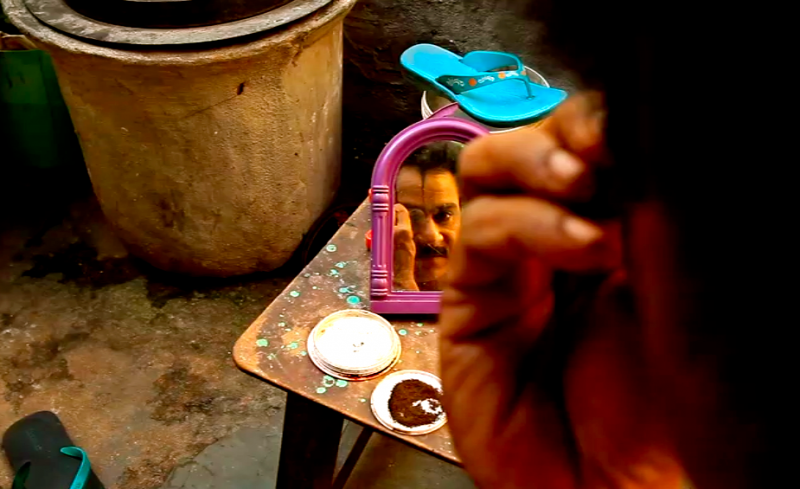 First, our film explores the unique importance of popular culture for the lives of people in South India. The influence of cinema in the lives of people is truly unparalleled in other parts of the world. Rajnikanth fans do not just stay overnight waiting for a film, they dedicate years of their lives for their stars. From selling their homes to support fan club activities to climbing mountains on one's knees to pray for the success of a film, no act is too extreme. Anything one does for God, one could do for the right film star. Fan club members who are not a fringe group, but a very sizable population, enough to make large blockbuster films recover their entire multi-million budgets through fan spending alone. The second issue we cover, by following the fans in their daily lives, is understanding fan culture from a socio-economic perspective. Who are these fans? What are the consequences of their actions? Where do they end up? What does this all say about the “India Rising” discourse of a growing, inclusive, economy? What are the fans within this whole system? The goal at the end of the film is to tell a human story of passion, devotion, and expression. From a lens, what the fans do need to be understood within within a larger context. The stories of the protagonists (Ravi and Mani) are supported by many smaller, often poignant stories of other fans. In the end, the character of the star is itself eclipsed by that of the fans. "Bollywood’ a derivative assigned to the Bombay Hindi film industry, has been of international interest since forays into Indian film narrative style by Hollywood blockbusters like Slumdog Millionaire. Yet little is known of the south Indian cinematic culture, which is as prolific and bears many of the same narrative and the elements as its northern cousin. The southern industry though bears one significant difference - the cult of superstar. While the major movie stars in Hindi film industry enjoy the adulation of fans and tabloids alike, they cannot hope for 50-foot cardboard statues bathed in milk and honey on the day of a film release. They can rarely aspire to a guaranteed sell out of the first several shows, let aside the prospect of riots at theatres where fans cannot procure tickets. They cannot hope that fan-club members will hold a knife to the projectionist to ensure the film is paused at the first appearance of the beloved star, so that the theatre audience gets an uninterrupted cheer at the freeze frame, and the front row has the chance to conduct a short prayer facing the image of the deity of the day. Nor do they expect that fans will riot if their favourite star’s songs are not replayed, mid-movie. Our film explores the activities of fan clubs through the life and work of a few fans who have been avowed followers of Rajnikanth, a South Indian film star known for his flashy on-screen antics. We follow fans such as Ravi, a politician in a small town who consistently organizes fan events where they plan activities around Rajnikanth’s films including a recent climb up a rock mountain on bare knees to please the gods and pray for his success. We follow Mani, a peanut seller and former gangster who turned legit thanks to the moral messages he received from Rajnikanth’s films, though he continues to put his family at financial risk by selling his wife’s jewellery to fund fan activities, Kamal Anand, who feeds his family by imitating Rajnikanth on stage and finally Gopi, a wage labourer at a gas company who had to sell his home because of debt incurred in fan activities. From the early waves of cinema in the state, narrative content has swayed between melodrama and propaganda, maintaining at its center one critical piece – the icon. Film stars in South India have explicit titles – ‘Mega Star’ Chiranjeevi, ‘Power Star’ Pawan Kalyan, ‘Ultimate Star’ Ajith, ‘Mega Power Star’ Ram Teja, ‘Stylish Star’ Allu Arjun, and even ‘Little Super Star’ Silambarasan. The buck stops, however, at the granddaddy of them all, the one who retains just ‘Superstar’ the indomitable Rajnikant. In his mid-60s, Rajnikanth cakes on hours of make up for every shot, to make him look like the young virile superstar smashing through villains turning the women wild with desire. His fans will accept nothing less. Fan clubs play an important role in local politics, and from informally mobilizing support for political parties to themselves playing a lead role during elections. Should the film star finally decide to walk down the path of politics, the army of supporters is ready at hand. For many of the lower-middle class youths who comprise these, the fan clubs are their way of asserting their place in a rapidly changing India. It is easy to dismiss the fan clubs of south India as a cultish parody of misplaced testosterone. The fans who commit acts of self-inflicted pain often mirror Hindu religious practices, in which the proof of devotion to a deity is often paraded by some extreme form of generosity, self-denial or pain. But for the vast majority of the young lower-middle class men who dominate these, the club is a manifestation of their cultural and political belonging and a means for them to assert themselves in society. The fan club emerges as a site where the classes excluded from the social and economic ascendance can mark their territory. The fan club for some viewers could be the ultimate manifestation of a tribute to cinema, and for yet others, a scary specter of the incredible power the film medium can invest in its stars. Our primary narrative technique is interviews and observations, but we also use archival film, artwork and music in the film. Some of this archival footage describes some of what we discuss – clever innuendo hidden in song lyrics, lines that are aimed at pleasing fans, and the ubiquitous, thinly disguised social and political swipes peppered through the films. A major objective of the documentary is to recreate the look and feel of Tamil cinema, the visual culture of South Indian cinema is unique, and something we hope do authentically and sensitively. 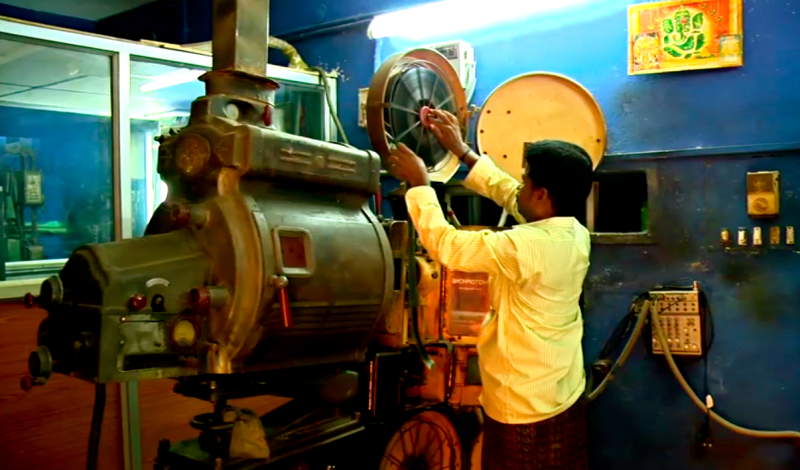 Our film is shot on location in the metropolis of Chennai, and the small town of Sholingur, both in Tamil Nadu, India. We also cover the release and aftermath of two Rajnikanth films – Enthiran and Sivaji 3D, to highlight the frenzy around a film release, and cover the birthday celebrations of the star throughout the two cities on 12.12.12, deemed an extremely auspicious date by his thousands of fans. "It is part of the fanclub's life style, a part of creating an identity for themselves. And ourselves. When I say "them" please don't think I am not one of them. I am a fan too." Joyojeet Pal is a first-time producer & screenwriter, who has written professionally as a journalist and as an academic for 15 years. His past research on screen culture in south India was central to the idea of the film, and it is a topic on which he has written extensively in the recent past including in major international film and media studies conferences. He has recently worked on the portrayal of disability in Indian cinema, and on the impact of the technology economy on the projection of aspiration in south Indian cinema. He comes from a long line of filmmakers in the Indian film industry, and is currently employed as a professor of information studies at the University of Michigan, Ann Arbor. Films and cinema being her first love, Rinku Kalsy left her well paying job in Hong Kong and went to study the techniques of Filmmaking in Amsterdam. Along with various workshops she has taken at the prestigious Binger institute in Amsterdam. She also holds a bachelor’s degree in Economics from Bombay University. 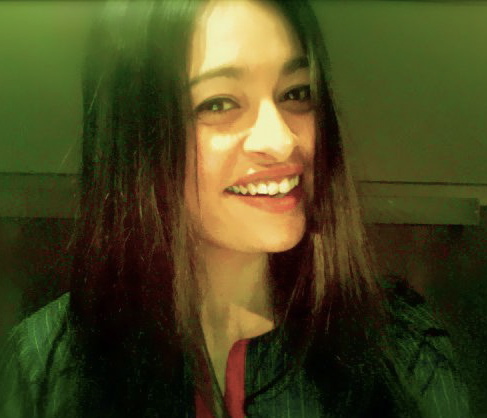 She started her Media career working at different studios and advertising agencies in Mumbai. Which includes Dungarpur Films, Avitel and Applause Entertainment. Her repertoire encompasses everything from ideating and researching scripts, Directing, Pre-production, Camera work to Post-production. As well as being an Apple certified Final Cut Pro editor. She has directed, produced and edited Documentaries for Dutch broadcast channels. And documentaries that were made for International film festivals. on behalf of the filmmakers we would like to thank you for your donation. As you all know unfortunately the crowdfunding campaign did not reach it's goal. All refunds are processed at this moment, we are sorry for the delay. For any questions about the project, please contact the filmmakers. To all the supporters of "For the love of a man" a very special thank you for your support. We really appreciate your effort, and taking time to donate and to like our project. It means the world to us. Please do continue your support by spreading the word. Thanks to you we are at 20% of our goal. We'll give our blood for him! SSRK - Super Star Rajini Kanth, a facebook fan club, discuss how social media serves as a means of brotherhood, but also to mobilize resources like blood donations in the name of Rajnikanth, who is not even human for them anymore. He lives at a different level. You are an official fan for this project! - you can claim your 'high-five' when meeting the creators - i'll keep you updated! ALL privileges of the executive producer plus an invitation to speak and comment at premiere events.